Grandmama's Stories: THE PERFECT HAMBURGER...IT'S ALL IN THE SMASH! I Love a REAL Hamburger. The kind you get at some little hole in the wall restaurant or local diner. 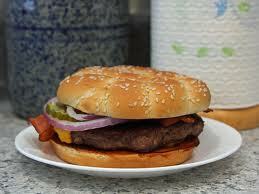 One where the sides of the meat are uneven and the patty covers the whole bun! The Bun is lightly toasted with leaf lettuce, fresh garden tomato, extra Hellman's Mayo, melted cheese, slice of Vidalia onion, bread and butter pickle, ketchup, just enough salt and pepper....Oh My mouth is watering...YUM!!! Here is what she told me! I asked her , "How do you get your hamburgers to taste so good?" She told me the magic is in the way you patty the meat! Don't overdo this step. The less you work with the meat the juicier! I like this step! gets out all my frustrations! A very irregular hamburger patty. I make a hole in the center to make sure it is cooked all the way through. OOPS, I forgot to take a picture of this step. Season well on both sides then slide meat patty onto griddle, or grill. Cook meat with the goal of only turning meat once. The BEST TASTING HAMBURGER EVER! IT'S ALL IN THE SMASH! P.S. I've not been able to reply to all your comments this past week due to some computer issues PLUS, I've been so busy attending grandpeeps end of year activities!! I do read them all!! I am so grateful for my life with grandchildren. They keep me young! Oh, YUM!!! I want to make a hamburger right now!!! There's nothing like a good burger! Looks delicious! I'll hafta try it....looking forward to your posts about Camp Grandmama!